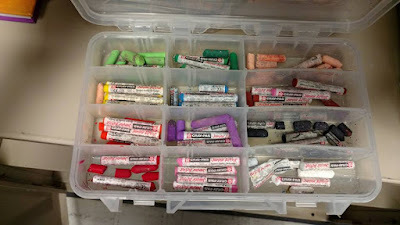 I have listed below a collection of ideas to manage Sharpies, X-acto knives, pencils, erasers, yarn, clay, glue, printmaking, paper scraps, and pastels. There are also ideas for organizing miscellaneous materials here. Finally, at the bottom of this post there are examples of how to handle it when students steal. Line up your Sharpies/Gel pens/etc. and then spray paint a stripe of unusual color to mark your tools/materials. This is harder to take off than tape. 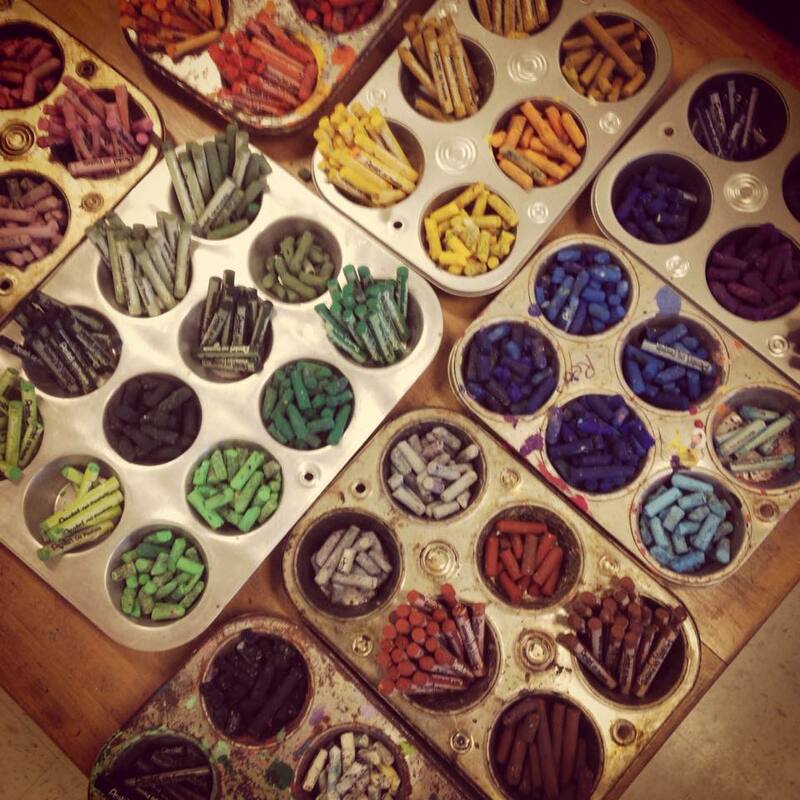 This idea is from Amanda Miller on the Art Teachers Facebook page. Danielle McLain says, "I have my seating chart in a plastic sheet protector. Any time I loan a sharpie, I write a big "S" on their spot in dry erase marker and wipe it off when they return it. Best system I've found so far." 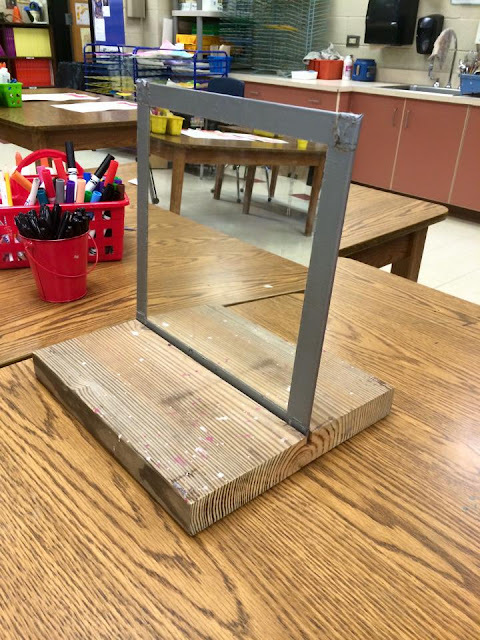 Lisa Shapiro Schustak has these silverware organizers on each table to help with tracking basic supplies at the end of class. Use foam blocks (floral, etc.) 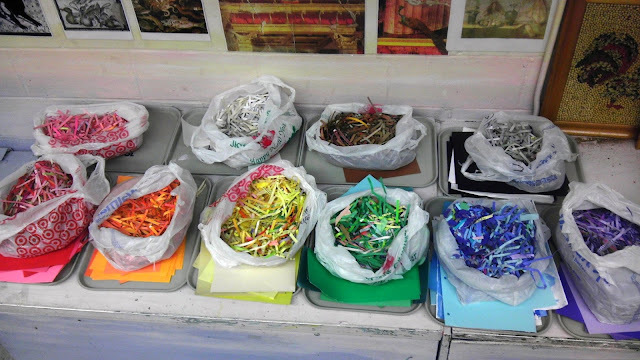 or wood scraps with holes drilled in them to organize materials like Sharpies, metallic markers, scratch art knives, etc. If all the holes in the foam aren’t filled, I know there is still a tool out and I don’t let the kids leave my class until it is found. Number your tools and assign them to specific students or tables/groups. I also read an idea where a teacher drilled holes in a board, glued marker caps in the holes upside-down, and used these to store tools such as x-acto blades. Again, he could look at the board and SEE AT A GLANCE if any were missing! 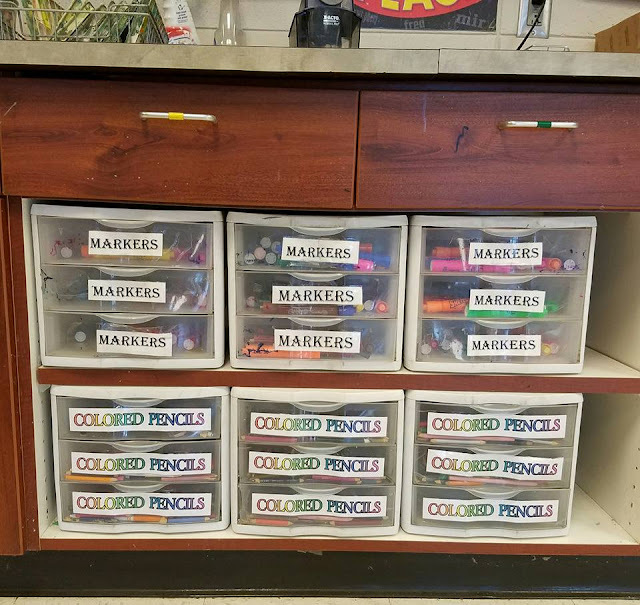 Organize drawers of markers, colored pencils, etc. with smaller containers such as wet-wipe boxes. That way, passing them out is simple! 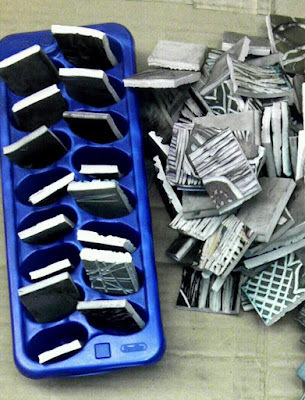 Use ice cube trays for small items like erasers - you can tell at a glance if any are missing at the end of class. Dawn's glaze tiles are brilliant - she has them sectioned to show kids what thin and thick layers of the glaze color looks like. She also stores in progress pieces in butter tubs - I love it! 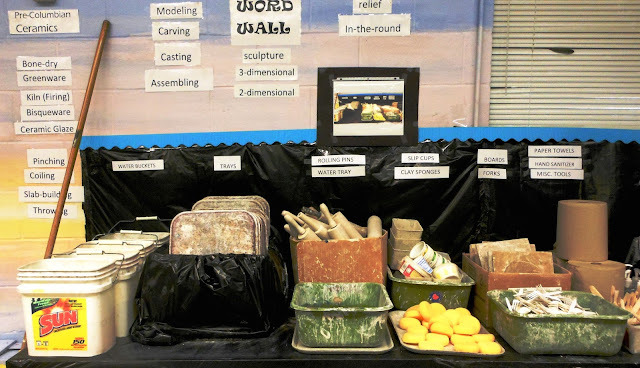 In my middle school classroom (with large classes), I had a "clay cafeteria" set up on one counter for kids to line up and get their clay tools and materials at the beginning of class. 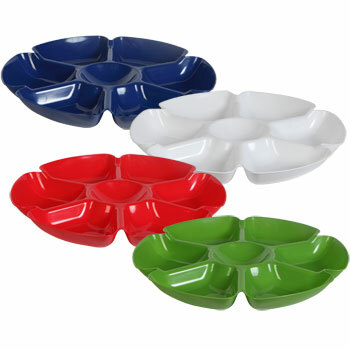 The trays (cafeteria trays) were picked up first so they had somewhere to put their tools, slip cups, or textured items. I also posted a photograph of the neat, tidy counter so the kids could refer to it at the end of class. Nobody left until it was returned to order! 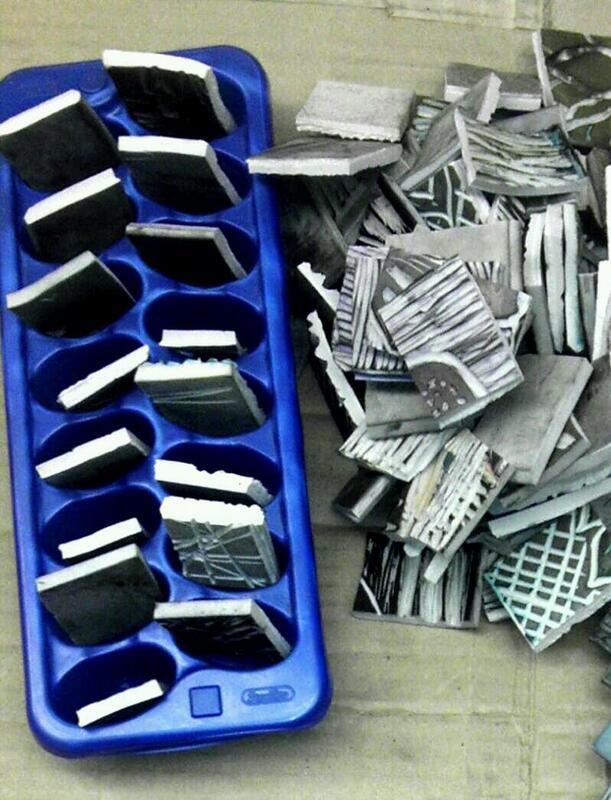 I recycle used soft-cut printing plates as erasers. I just use a box cutter to slice them up into eraser sized pieces and if they get lost or destroyed it isn't as big a deal! Also, they don't disappear as quickly because they are not "nice" and pretty. 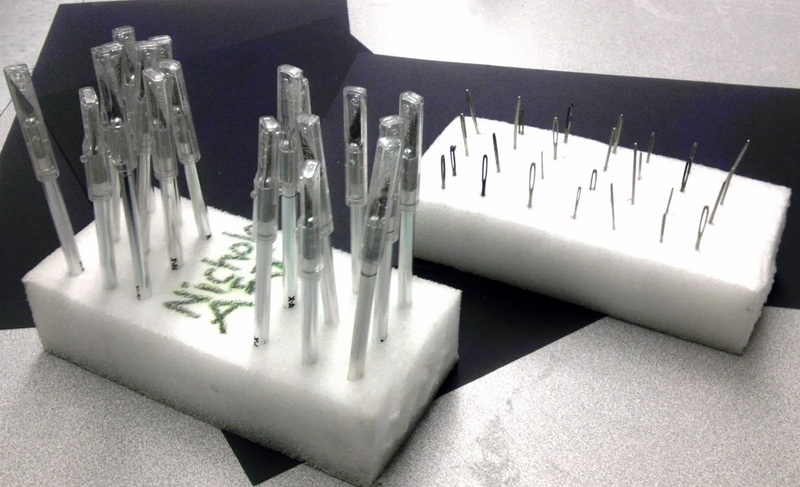 The tall water bottle ice cube trays work really well for keeping track of Sharpies and other drawing utensils. Here is another brilliant idea (from Adriana Ranta) to keep up with Sharpies - imbed the lids in plaster of paris! 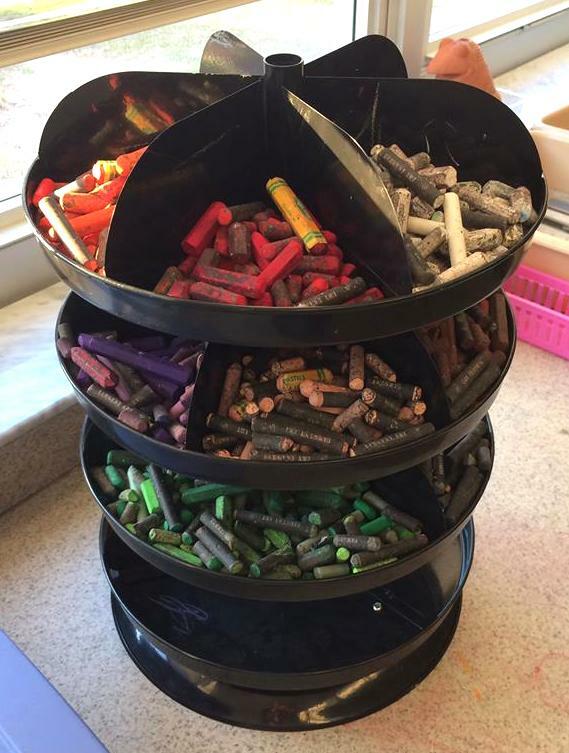 Ashley Saddington Olsen-Potthast has a set of muffin tins on her counter for keeping her pastel colors separated and organized...her students get the colors they need, then return them to the appropriate place when they are done. She says, "It's the best thing I have ever done! The blog, Creativity in Connecticut, outlines how Jaclyn Bono scored jewelry organizers at Michael's for just over $3 each! 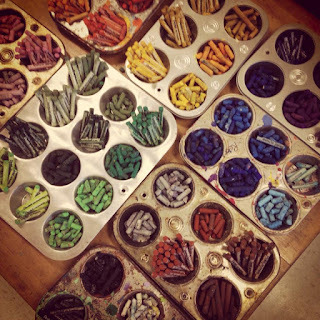 Lisa Eckman Phipps uses drawers to organize her drawing media. This picture is from her classroom. Thanks, Lisa! Just for fun, here is an educational film reel from circa 1973 (produced by the Centron Corporation). Enjoy! When I taught at a large middle school with high numbers of disadvantaged students, I occasionally had problems with theft or vandalism. Sometimes, I didn't address a minor problem (let it go!) and sought out proactive solutions such as counting the materials at the end of class. However, when safety was a concern, you bet I tackled the problem head on. I have been known to take art privileges from the entire class! This is very infrequent, but sometimes it IS necessary. After all, when it comes to safety and care of materials, everyone is responsible. Keep in mind, it isn't usually a good idea to be confrontational and angry. As long as the below scenario is done without lecturing, scolding, or yelling, there is a pretty good chance the kids will eventually comply. Confrontations are not pleasant; I would choose these battles very, very carefully. When I discover there has been theft, a safety issue, or another serious misdeed that I didn't witness, I give the kids an opportunity to tell what they saw in writing before I take privileges away from the whole class. This gives them a "safe" place to say what they know because nobody else knows what it is they are writing. Everyone writes something, even if it is just, "I didn't see anything" and they must sign their names. I tell the kids that I will honor anyone who comes forward and admits the mistake. Then, I have a whole collection of eye witness accounts in my hand as leverage. If you have built a positive environment and won students' trust and respect, you shouldn't lose all of that simply by holding them accountable for doing their part in sharing responsibility for materials. Years ago, an 8th grade group was using the clay to make tiny missiles and throwing them when my back was turned. They were pretty sneaky about it because I didn't find the balls of clay until later. This was just kid mischief, but because it was clay there was an added layer of safety issues. Dry clay when crushed underfoot creates silicon dust which is quite dangerous to breathe. The kids had been taught this, so when I began discovering random clay BB's all over the classroom, I told them that if they wanted to continue using clay they needed to let me know who was responsible. If not, we would read and research about clay artists. That was that, we got out the paper and pencils, and the first day no one talked. The next day, we got out the paper and pencils, and there was some pretty serious griping. Nobody was happy. Finally, they caved and turned in the culprits. That group of 3-4 boys had to clean all the clay tools instead of making art with the rest of the class. It took them 2 days. They were pretty good the rest of the year. Every year after that I told this story to emphasize that the entire group is responsible for safety and caring for materials and that if they saw something, they needed to tell me right away. Theft of Your Personal Belongings: "If a student steals something minor off my desk/something personal of mine, I ask the school officer to attend the next class. I discuss how I take all incidents of theft seriously. The school officer is just there for show. Typically, I won’t get the stolen item back, but the kids are scared to steal anything else and/or are more likely to report incidents of theft. I’ve had the school officer show up when so much as a quarter has been stolen; it is effective. Theft of Expensive Items: Sometimes, students steal items of high value (personal or monetary), and getting those items back takes precedence over a consequence. I handle this psychologically, and I’ll explain via an example. I keep a small zipper bag of all of my USB drives; it contains about twelve drives. These drives house all the lesson plans I ever written (200+) among many, many other items. During the course of a class the entire zipper bag was stolen. I was beyond upset at the loss of the items. I appealed to my classes by describing the situation, describing how important the items are to me, explaining that I would be happy to give the drives to the thief, so long as I could get the information off the drives first, and that I would give two Chick-Fil-A biscuits to the person who gave me either the USB drives or the information to get the USB drives. Finally, I made a reporting box in the event students felt more comfortable giving anonymous tips. The day after my appeal, a student came up to my desk and turned in all of the missing USB drives stating: 'I found these in the hallway.' I have no idea if that was true or not, and I didn’t care. I got the USB drives back. I duly gave the student two Chick-Fil-A biscuits, and offered the emptied USB drives to him/her, which s/he refused. Not only did I get my items back, I gained a lot of respect from my students; they were impressed I kept my word. This year, when my cell phone was stolen, students turned the school upside-down to find it and return it to me; they took it personally. Oh, and I’m now a big believer and user of Dropbox." In response to the "stolen sharpies" issue: I hear you loud and clear! In my classroom Sharpies are not a class supply. Sharpies must be borrowed directly from me. This gives the sense of “checking out” the sharpie like a book. I tell the student “I am giving the sharpie to you and no one else. If it goes missing, I’m coming after you.” That student is then responsible for returning it to me. 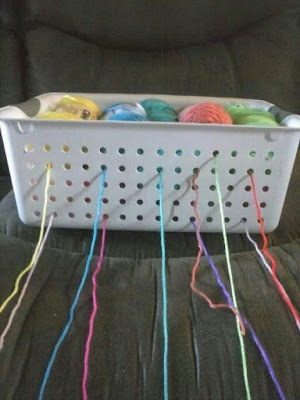 I have incorporated "kit" baskets recently that have the main tools and or supplies for the given project. I keep count of the number of items on each table that students are responsible for. 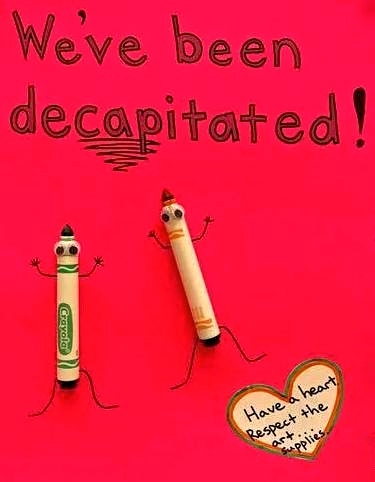 The main tools that go missing are sharpies! If you allow students to get up, only allow a limited number at a time. I have found that hand-held sharpeners at their desk eliminates unnecessary "up and down" movement. But, I have to collect these after each class or they get stolen. So, that is a down side. However, I have supplies to collect after each class so it’s really no big deal. You can assign a reliable helper to collect and tell you if a table is missing theirs. Where do you put your class work? What is your system? Is it easy to navigate WITHOUT detailed instructions? If not then you need to rethink your plan. I have 5 cardboard boxes with dividers per teacher for K-2. I have drawers for 3-5. Each is labeled by day and teacher. My schedule is posted on each box for the day so ANYONE can find a class’s artwork. 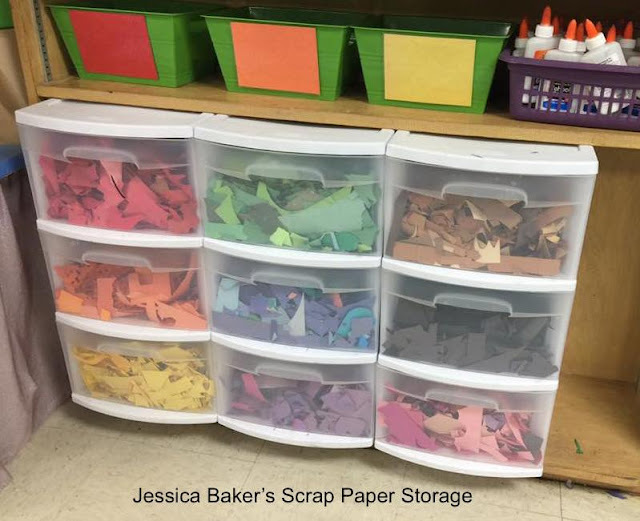 The biggest classroom management issue I have is making the students realize that the art room is still a classroom that functions under the same guidelines as the other classrooms. Because of the creative atmosphere, students often think that the rules are more relaxed. 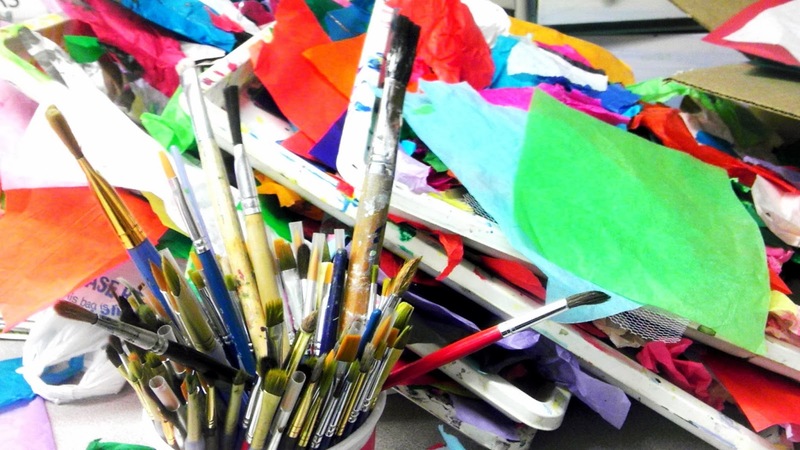 However, as you know, we have hazardous materials and a greater potential for accidents and injuries in the art room. What helps are routines and procedures. Students understand how to clean up, where materials go, where their work is to be stored, etc. I grouped the students into tables, sitting up to 8 at a table (2 long tables together), and they have a group responsibility to keep materials neat and cleaned up. The grouping encourages collaborations and good flow for walking around. When I am done talking, I do not mind if they talk quietly at their table. I do assigned seating as needed. I always stop production 5 minutes before class ends for cleanup. They stay at their tables until dismissed-girls go first on even days, and boys go first on odd days. 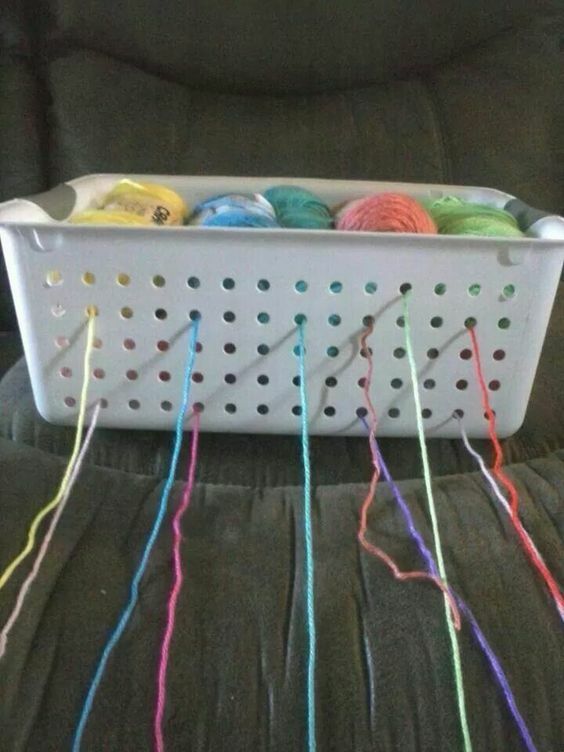 I have incorporated "kit" baskets recently that have the main tools and or supplies for the given project. I keep count of the number of items on each table that students are responsible for. The main tools that goes missing are sharpies! Our school incorporated macbooks for each student’s learning this year, and we use them for research and googling imagery for projects-we do not get them out if wet materials are used. This allows students to take a more personal approach to creating art, and I have noticed a major difference in results. 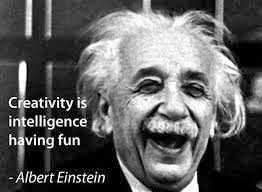 There is more motivation within the students and more variety in subject matter (as opposed to what I offer them). For cleaning brushes, I have a system set up by the sink. 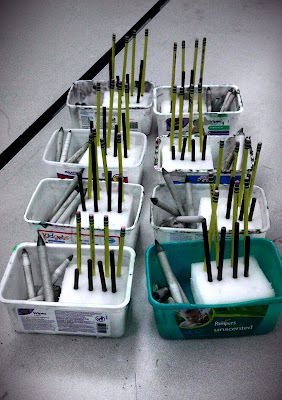 There is a soapy water bucket, then the students rinse, and then the brushes get “pointed” and put “hair up” in the brush container. I never allow students at my sink but ONE at a time and only if absolutely necessary. They have nothing really that is a big deal on their hands from art that they can’t live with. On really messy days I pass out wipes. I request wipes regularly from parents throughout the year through letters home and school cast calls. Wet wipes/baby wipes/wet ones (whatever you want to call them) are my best friends in an elementary classroom. 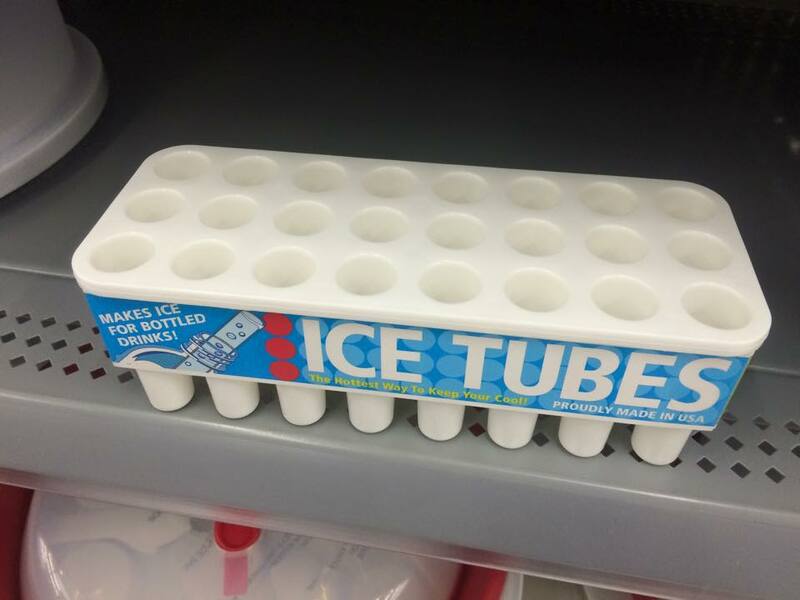 I used to purchase these with my own funds, but it got out of hand. So now, I get with each grade level at the end of the school year when they are putting together their school supply lists to send home to parents. I ask each grade level to add an extra something to their list that I might need (wipes, papertowels, kleenex, hand sanitizer, soap, pencils, copy paper, etc.). Then when they collect items at the beginning of the school year, I go around and collect what I need! Get 1 or 2 large (5-gallon) buckets from the cafeteria (or a restaurant- like pickles come in). Fill that with water (2/3 to 3/4 full) and set up clean-up stations. Students can clean their hands (not perfect, but pretty well) in one of these buckets, and dry on paper towels (or terry towels from the custodian). These buckets can also be really useful for painting activities: one full and one empty. Students can dump dirty paint water in the empty bucket and refill (using a cup, not dunking their water bowl!) from the full bucket. Even with a sink in the room, this saves a lot of mess and problems at the sink(s). At the end of the lesson, dirty paintbrushes can be rinsed in the remaining clean water if there's no sink in the room for cleaning them. The buckets are also helpful if you are doing a project requiring wet paper for your painting-- After students write their name and class on their papers, as they are sitting with their paints at their seats, the teacher can quickly make the rounds of the room dunking their papers in the bucket. This is much faster and simpler than the class lining up at the sink to do this then carrying dripping papers back to their seats... and there is no delay in the students getting to work on their paintings. BTW, I hope you aren't paying for all these wet wipes out of your own pocket. It sounds like a lot of wipes...and money! If you can work out an arrangement with the building engineer/custodial staff to have some terry cleaning towels, it could save money on the wipes and save them work since you may be able to do a more thorough job of clean-up, leaving less for them to deal with. One teacher in my district has large square tables She puts a tub with damp terry towels in the center of each table for 4-8 students to share. They clean hands, brushes and tables with the damp towels. At the end of the day she wahes/rinses out all the towels. At the end of the week she puts her big bucket of towels out for the custodians and they trade her for clean ones for the following week. No more altercations at the sinks, no more floods on the floor. Unfortunately, my tables are the wronk shape for this... so I am still trying to figure out how to implement this in my room. So far, the towels are helping me, but not quite as much as her. Sharpeners are so important. I decided to use the small metal sharpeners because they work really well. I use a jewelry organizer with each pocket assigned a number. Each seat also has a number. So if you're at seat 8, you use sharpener 8. It helped with accountability. 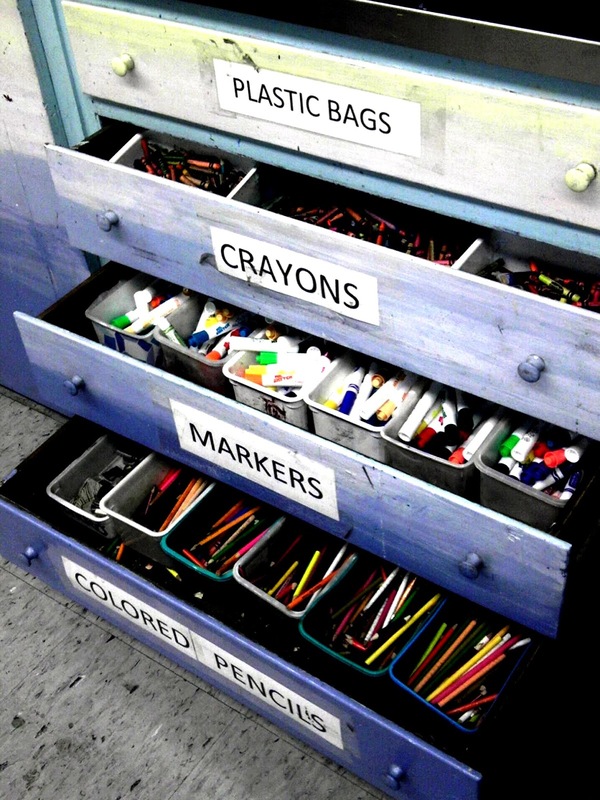 I also use bins for basic supplies like colored pencils and markers. One of the compartments has plastic solo cup or 'mini trash can'. This allows students to sharpen at their seat without making a mess. It has been amazing. I think I lost maybe 5 out of 30 sharpeners last year. Not bad.